Skynet Asia Airways was established in 2002 with the original name being Pan Asia Airlines before changed to Skynet Asia Airways. The airline operates as a low-cost airline and its main base is centred at Miyazaki City, Japan and serving a total of 4 domestic flights in Japan. Skynet operates scheduled domestic flight services between Miyazaki/Kumamoto/Nagasaki and Tokyo. Recently, it introduce flights to Kagoshima, Japan. 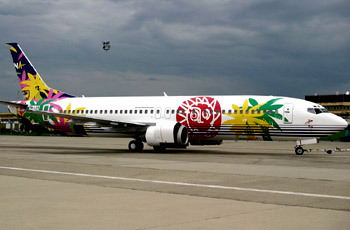 Skynet Asia Airlines is owned by the Industrial Revitalization Corporation of Japan and Mera Electric Industrial Corporation and the airline has a total no of 8 Boeing 737-400 aircraft. Skynet Asia Airlines offers its passengers good services with a comfortable journey, good ambience and also provides the lowest airfares. Check flight schedule, flight status directly from Skynet Asia Airways official website. You can also check on the cheapest airfare, flight schedule, flight status, airlines offices, contact number, airlines packages, air cargo partners, air ticket prices and booking procedure, international airfares, frequent flyer and other flight information and travel deals and packages. When you are making an airfare booking, select from either economy airfares, business class airfares or first class airfares whichever you prefer. Have a pleasant flight journey and enjoy your holidays or business trip!